Or any Copper CowBelle member! If you wait until Saturday, you can purchase tickets at Aunt Judy’s until 2 pm or you will need to buy at the door and the price goes up to $30. Playing for the 2012 Shindig! Musicians heavily influenced by older country artists like Merle Haggard, Buck Owens and Patsy Cline would be one way to describe the Yarbrough Band of Las Cruces. The band began in 2007 as a family three-piece with a young Jacy on vocal and fiddle, Dawson on the guitar and father Jason on vocals and bass. The current lineup – which has been in effect for the past several years – also includes Milagros Guillen on vocals and fiddle and Julian Medina on drums. The Yarbrough Band tours around the southwest and plays on a weekly bases. You can find them at county fairs, wedding receptions or local events. 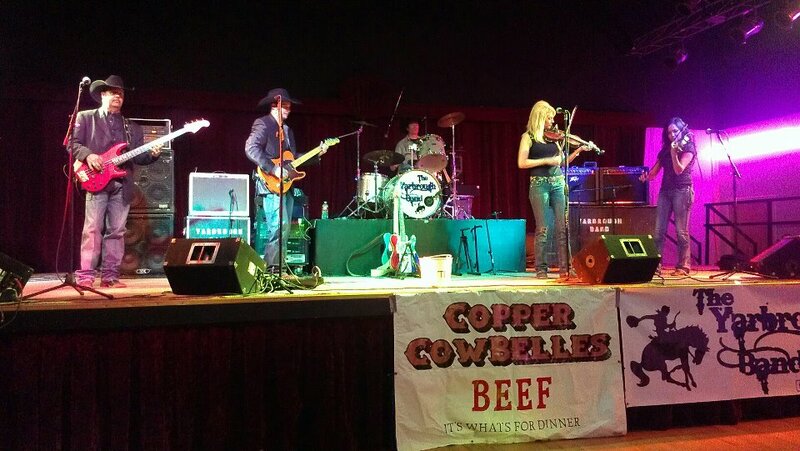 The Yarbrough Band will perform again this year at the annual Copper CowBelles Shindig. A long-standing tradition in Grant County, this dinner, dance and silent auction on April 27th is sure to have something for everyone. The Shindig was originally started as an event for local ranchers to get together and socialize. Today, the event appeals to individuals from all walks of life and the highlight is the dance. The band released their first album in the summer of 2012. The self-titled album contains some of the group’s most famous covers, as well as a couple of original songs. Dawson Yarbrough says that including mostly cover songs was the best way to attract listeners, but he hopes the next album will have more of the band’s own songs. “With this album we just wanted to do songs we’ve been playing for a while.” According to Yarbrough, classic country acts from the 1960’s have laid a musical foundation for the band, “We have just modernized the music a bit to make it more energized.” The music played by the Yarbrough Band appeals to young and old alike. At rodeo dance, for example, you will find just as many if not more, youngsters on the dance floor as adults. Yarbrough states that the main goal of the band is not to get “rich and famous.” They pride themselves on their live performances and play simply for the love of music. Their favorite shows are the ones where when people get up and dance. You can get tickets to the dinner and dance at Aunt Judy’s Attic, Western Bank, Farm Bureau Insurance; Susan Sumrall or Alotta Gelato. Ticket prices are $25 in advance and $30 at the door. The doors open for the dinner at 6 pm and the Yarbrough Band starts up at 7:30. The Shindig takes place next Saturday, April 27th at the Flame Convention Center in Silver City. This event is a fundraiser for the CowBelles and proceeds support local agricultural projects throughout the year. For more information contact Pat Hunt at 574-7649.